The consensus of those in the coal industry is that, even with stricter regulations, coal will remain an essential player in the energy market; it is just a matter of figuring out how to function in the new legislative landscape and still make business work. Get started absolutely FREE in 2 minutes, plus receive a free printed magazine. According to the International Energy Agency (IEA), coal fuels more than 40% of global power and is used almost exclusively to produce all non-recycled steel. But in spite of this, the US Energy Information Administration (EIA) reported that, in 2016, coal production is expected to decrease by 18%, the largest annual decline of both tonnes and percentage based on data dating to 1949. 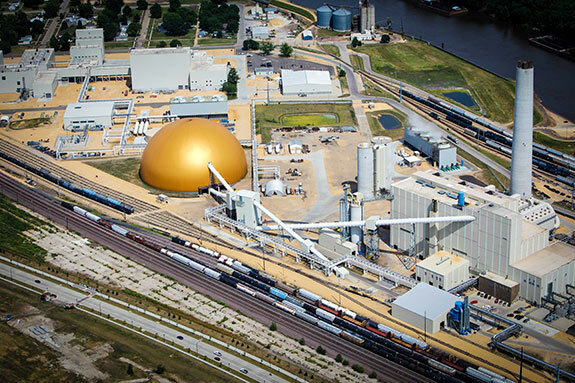 A coal storage dome built for ADM Cogeneration Coal, Iowa, is located near both rail and a port. One state undergoing major change is California, the state that, according to Peabody Energy, has far worse air quality than coal-dependent states. As California retires coal power options and expands solar and wind, two phenomena occur: utilities costs climb and blackouts become more common, as there is little cushion for supply disruption. But that doesn’t affect coal companies; that affects citizens. Coal companies face other issues, such as strict US Environmental Protection Agency (EPA) regulations, including implementation of 2011’s Mercury and Air Toxics Standards. Amidst these changes, coal supporters with groups, such as the nonprofit CoalBlue Project, are adopting a proactive approach. Their method is three pronged: campaign for low-carbon coal; capture carbon before it reaches the atmosphere; and work with politicians (specifically Democrats) to promote an environmentally acceptable approach to coal production and burning. Inside the ADM Cogeneration Coal dome, a system was customised for desired reclaim. Quasha predicts that coal will continue to be an important part of US energy production but that areas such as covered storage and transportation will become major focuses during the next decade. According to Adam Aagard, Engineer for Dome Technology, the EPA is particularly concerned about runoff and windblown dust from open piles: “That’s why they’ve been putting coal under cover,” he said. As additional proactive measures, coal producers are working towards improved carbon capture via stacks atop the structures where coal is burned; these advances in emissions-capture technology decrease the release of many components in the combustion gases. As companies work to contain coal around the world, more are choosing domes as a storage solution. Dome Technology has seen an uptick in domestic and international coal customers in the past five years. 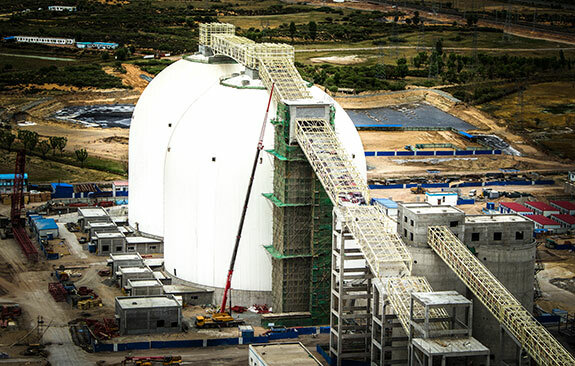 The company has completed projects in Asia and the US, constructing a dozen domes since 2011. That’s an increase in the average number of coal domes built during any five-year span. Aagard said the international projects unaffected by EPA regulations are being driven by energy demands from a burgeoning middle class; more people means more energy must be at the ready. According to Aagard, coal companies choose domes for one main reason: seamless domes help companies deal with air and water issues from open coal piles, while still providing ample storage. An airform surrounding the entire dome prevents moisture from seeping in and dust from drifting out, and “the good thing about a dome is the size – the amount of storage you can get in them (and) the ability to stack it high in a small footprint,” he said. Based on the ability to build up rather than out, domes store a large volume on a smaller foundation, eating up less property at the site. While some customers require three to five warehouses to store product, one dome will likely accommodate the same amount of material in one structure. Diverse foundation systems that can cost less than those of typical silos and warehouses make this level of storage possible, according to Dome Technology Sales Manager Lane Roberts. The double curvature of a dome provides strength at all points of the structure, even near the apex. 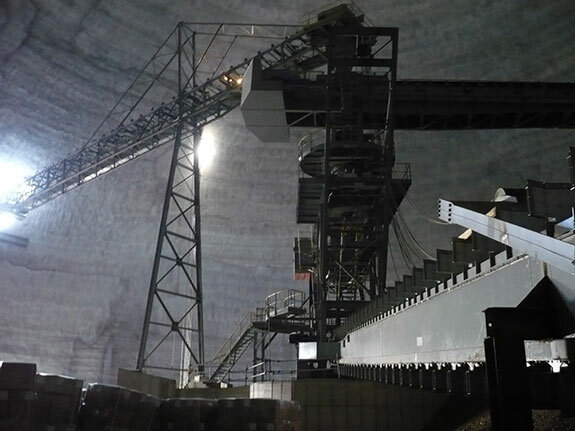 With strength at the top, a coal company has no problem securing adequate space for an ample headhouse where employees can do their work and transfer locations can remain covered so conveyor systems are protected and weather is sealed out. Outside the headhouse but also at the apex, dust collection systems thwart particulates trying to escape. 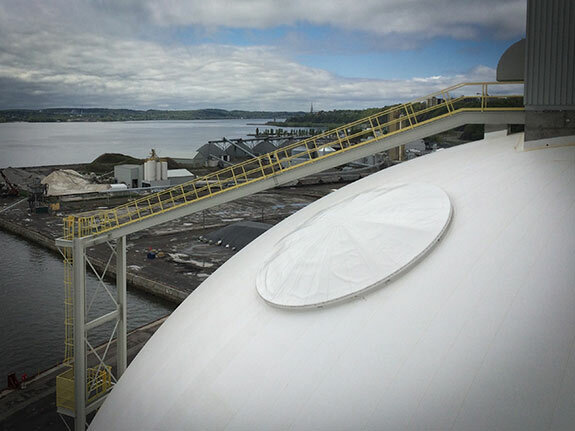 The dome shell can also accommodate explosion venting, and Dome Technology has recently pioneered a round hybrid model that will be the company’s preferred method moving forward, a contrast to square and rectangular explosion venting that has been the norm in storing products prone to deflagration. Domes stand side by side at this China Coal site in Hulusu, China. “No matter what system, you’re creating a weak spot with panels, whether it’s a pre-manufactured rectangular panel or a metal cladding piece. This is a round panel, which in a dome is nice because you don’t get sharp corners for stress concentrators,” Aagard said. The proprietary explosion vents comprise a metal ring fastened directly to the dome with pressure-release screws; these screws are engineered to remain secure through dead, live and wind loads but will release if the interior pressure reaches critical levels. On the metal ring, another ring is fastened; this one is attached to a geodesic steel lattice covered with fabric. The lattice helps the fabric hold its shape and the fabric acts as a waterproofing shield protecting product and helping maintain the dome’s interior climate. When an explosion occurs, the fabric accepts the load and transfers it uniformly around the ring’s circumference. “Because it’s circular we can predict the load going to each of the fasteners really well,” said Jason South, Dome Technology Vice President of Engineering, Research and Development. “If it were rectangular, the pressure going to each fastener could be different,” and more difficult to estimate. With a defined amount of required surface area, Dome Technology’s team sizes the explosion vents and places them in locations where they’ll vent adequately and function structurally. As another means of controlling interior conditions, coal domes are designed with the ability to cut off air supply. Engineers help companies determine how to seal reclaim hoppers and tunnels as needed – a solution for fire prevention and environmental protection. Even with all the available bells and whistles, throughput speed is determinable, and if a dome is engineered with multiple tunnels and systems compatible with rail, truck or ship, operations can be efficient and meet company demands. “The dome’s not a limiting factor in the whole throughput process – you can fill and empty it as fast as you want with the right systems,” Aagard said. Dome Technology’s team has pioneered a type of round explosion venting that better distributes force across the dome shell. For those such as Aagard with their finger on the pulse of the coal industry, the environmental changes are a result of politics. “The trend that I foresee is they’re trying to shut down the coal industry because there’s political money to be made in alternate fuel and power sources,” he said, noting that there’s also money to be made in coal or it would cease to be a competitive industry. According to Roberts, coal companies that want to keep making money will have to accomplish two things: gain access at US shipping ports to export coal to countries where demand is greater and regulations are lower, and consider augmenting energy production by burning coal and another fuel, such as wood pellets, at the same site. But in the meantime, companies are securing coal within structures, such as domes, and meeting EPA regulations in the process. This article was written by Rebecca Long Pyper, Dome Technology, USA, for the December issue of World Coal. To read this and much more, register to receive a copy here.